Users of the BlackBerry Priv on AT&T can now enjoy a new software update on the phone that bumps the software version to build number AAJ925. The update installs the latest Android security patch for the month of March, which brings the security patch level to March 5, 2017. In addition to this, the OTA update also comes with a bunch of bug fixes as well as stability and performance improvements to the BlackBerry Priv. Many BlackBerry Priv owners might be eagerly waiting to see the new Android 7.0 Nougat OTA update come their way. Even though this update has nothing to do with Nougat, it is important that you download and install it on your phone for security purposes. As you know, this is an OTA update and as such, it will take time before all AT&T users of BlackBerry Priv actually the notification to install the security patch. But you don’t have to wait for it, instead, you can also download it manually via your phone’s Settings>About device>System update>Check for updates. This will enable you get the update ahead of others. According to AT&T, the latest Android security patch for the BlackBerry Priv weighs anything between 17MP and 222MB, so make sure you are connected to the internet via a Wi-Fi network just so as to be safe with the download. Also, ensure that your phone has at least 50% battery power before proceeding with the downloading and installing this update. 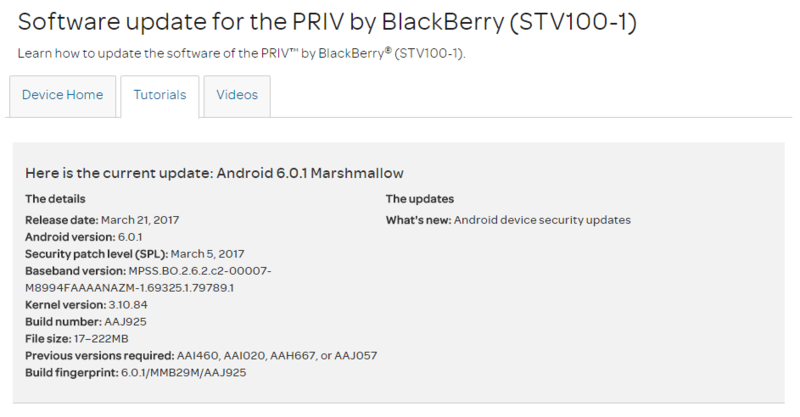 As noted earlier, this update is still based on Android Marshmallow, but given that the BlackBerry Priv is a 2015 flagship, we expect to see a Nougat treat arriving sooner or later. We’ll be here to let you know when this happens, but as for now, make sure you get March’s Android security patch installed on your Priv. Next Next post: OnePlus 5 vs. Google Pixel 2 – Which One Should be Your Next Phone?